Mr Bagher Nikfar holds an MSc degree in industrial engineering and is presently studying toward the doctorate degree. From the mid 80s he has been working in various industrial entities such as Behran Oil Co and has been the Managing Director of Parjala Co since the year 2000. Events- What is the production capacity of your company and your plan for exports? Bagher Nikfar- We are one of the largest producers of hollow blocks in Iran and one of the oldest in our field as well. The company was established about 30 years ago and today it has 400 workers who work in two shifts. Our annual production is about 140 million blocks and our sales amount to about 30 billion rials a year. We have not exported any of our products in the past but we are planning to do so in the future. 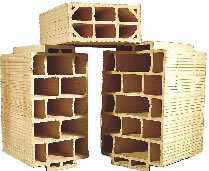 In fact the company intends to diversify its range of products to include other building materials related to our field. E- Would you accept to have agents/representatives abroad for your exports? BN- So far we have not been seriously involved in exports but as we expand our production according to our new strategy we shall definitely want to have representatives abroad and so we are already open to proposals, and would welcome them.